Dancers from Palawan State University in the Philippines will give the SHSU and Huntsville communities a glimpse of various world cultures with two performances on Thursday and Friday (Sept. 20-21). The Sining Dance Company will perform dances that span a wide array of cultures “that have been dominant in the Philippines over the century,” on Friday, at 7:30 p.m. in the Killinger Auditorium. 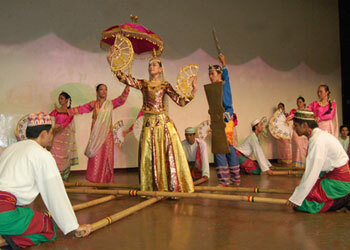 “They do an indigenous Filipino dance that includes tinikling, where they have long bamboo poles that they clap together in a kind of three-beat rhythm and dancers move on the floor in between the bamboo poles,” said Dana Nicolay, associate dean for the College of Arts and Sciences and professor of dance. Other dances in the company’s repertoire include a wedding ceremony dance, as well as dances from Thailand, Cambodia, the Spanish flamenco, a Dutch folk dance, American dances and newer contemporary dances. As a preview of sorts, the company will give an outdoor performance on Thursday at 11 a.m. at the Farrington Pit, during which they also will perform some of their contemporary works that may not be shown at the Friday night concert, Nicolay said. Admission to both performances is free. The Palawan State delegation, which is located in Puerto Princesa, will be on the SHSU campus all week with the help of vice president for Academic Affairs and provost David Payne. During their visit, they will be actively engaged in SHSU’s dance program by both teaching from their repertoire and participating in classes on campus to learn from SHSU’s repertoire. For more information, contact the dance program at 936.294.1875. More than 100 companies and organizations will be scouting out potential employees during the 2007 Career Expo on Wednesday (Sept. 19). The Federal Bureau of Investigation, the Houston school district, CenterPoint Energy, numerous banks and police departments from many of Texas’ metroplex areas will be among those available from 10 a.m. to 3 p.m. that day in the Johnson Coliseum. “If students register on ‘Jobs 4 Kats’ (before the expo), they can get a specific, detailed list of the companies that are coming, what majors they are looking for and what positions they are hiring for, full-time, part-time or internship,” said Vinessa Mundorff, Career Services employment specialist. Students also can register on Jobs 4 Kats after the job fair to find that information. All attendees are encouraged to dress professionally and bring multiple copies of their résumés. In addition, to ensure that students’ résumés are in order for the expo, Career Services will host its second “Résumé Rescue” on Monday (Sept. 17), from 10 a.m. to 2 p.m. in the LSC Mall Area. In the event of rain, experts will critique student résumés in the LSC Atrium. For more information, call Career Services at 936.294.1713, or to sign up for Jobs 4 Kats, visit https://www.myinterfase.com/shsu/student/. The Alcohol and Drug Abuse Initiative will show students how weight gain can come not only from poor diet and exercise patterns but from drinking as well during “Calories on the Rocks” on Tuesday (Sept. 18). Students can learn how many beers add up to one pound of weight gain at 3 p.m. in Lowman Student Center Room 315. “Many students do not realize the amount of sugar or empty calories they are consuming in alcoholic beverages,” said Michelle Lovering, ADAI proactive prevention chair. “Whether one would consider the drink ‘sweet’ or not, alcohol is basically sugar without nutrients. “For some students, part of the weight gain can be attributed directly to an increase in alcohol consumption,” she said. “Calories on the Rocks” will explore the caloric values of many favorite drinks, such as the number of beers that equal one pound of weight gain multiplied by 4-5 years in college, for example. The program is part of the ADAI’s Six Weeks of Alcohol Awareness Training program, an educational series aiming to increase awareness of alcohol abuse issues among students. For more information, contact Lovering at 936.294.4347 or org_aai@shsu.edu. Theatre patrons will have the opportunity to watch SHSU actors perform in an outdoor park in London, as well as tour the city and travel with the actors, with a trip being organized by assistant professor of theatre Ron Song Destro. The group will explore the city May 21-28, 2008, and watch the students perform a Shakespearean comedy in an outdoor park as a learning experience, according to Destro. Destro has been working on a study-abroad plan for SHSU actors to study at the Royal Academy of Dramatic Art in London, considered the best of its kind in the world. The cost of the trip, open to both members of the Huntsville and university communities, will be between $1746 and $1805, depending on the number of travelers who participate, and includes round trip airfare; a double occupancy room at a three-star, centrally-located hotel in London; breakfasts; and transportation to and from the London airport and the hotel, Destro said. The sign-up deadline is Oct. 15, and there is no limit to the number of travelers who wish to participate. For more information, call Destro at 936.294.1338. The reservation deadline for this trip was extended to Nov. 1. The SHSU Alumni Association will take a bite out of “The Big Apple” with a trip to New York City for its annual reception in December. The reservation deadline is Nov. 1 for alumni and friends who would like to travel to New York for the reception. The annual Alumni Reception and Dinner in New York City will be held on Dec. 7 at the historic Waldorf-Astoria hotel. The reception will begin at 7 p.m., followed by dinner. The event is open at no charge for SHSU alums and friends who might like to make the trip. Travel packages start at $975 per person, and arrangements can be made through Laura Floyd with Advantage Travel in Huntsville at 866.758.5466. Dinner reservations must be made separately through the Office of Alumni Relations. For more information, call 800.283.7478. Alfredo Vélez, III, SHSU assistant professor of music and associate director of bands, will share his roots on Wednesday (Sept. 19). The lecture, part of the Grassroots speaker series, will be held at 5 p.m. in Academic Building IV's Olson Auditorium. Vélez directs the Symphonic Band, Basketball Bands and the Bearkat Marching Band. Before coming to SHSU, he held positions at Texas A&M University-Kingsville, the University of North Texas, Texas Christian University and with the Plano school district, where his concert, jazz and marching bands were widely recognized for their outstanding performances, according to a biography on the School of Music Web site. Vélez received his bachelor and master’s degrees in music education from Angelo State University. James Cunningham, an award-winning speaker and author, will make money and financial issues a laughing matter with “Funny Money” on Tuesday (Sept. 18). The informative, “‘fun’-ancial seminar” will be held at 6 p.m. in the Lowman Student Center Ballroom. Using wit, comedy, and a multimedia presentation, Cunningham teaches the essential skills in earning, spending and saving money properly, first guiding participants to financial stability and then taking it to the next level: achieving great wealth and prosperity. While undergraduate credit debt decreased by 7 percent from 2001 to 2004, the average outstanding balance for undergrad credit cards was still $2,169, according to a 2004 credit card study by Nellie May, a Sallie Mae student loan company. Additionally, undergraduates reported the freshman year as the most popular time for obtaining credit cards, with 56 percent reporting having obtained their first card at the age of 18. Because students are often bombarded by credit card companies that visit campuses to solicit students with offers of T-shirts or food for signing up, it’s important to make sure students understand everything that goes with obtaining a credit card, according to Angie Burns, assistant director for Student Activities. “We want students to learn to budget, spend and save money effectively so they don’t go into debt while in college,” she said. Cunningham has performed his seminars at campuses across Canada for the past eight years. Among his accolades are two-time “Lecture of the Year” award and another “Lecture of the Year” nomination, as well as a “Comedian of the Year” nomination by the Canadian Organization of Campus Activities. In addition, he wrote and performed his own hour-long comedy special titled, “James and the Giant Speech,” for the Comedy Network. For more information, call the Office of Student Activities at 936.294.3861. The physics department will give the public a tour of “what’s currently up in the autumn night sky” with its planetarium series program beginning Friday (Sept. 21). The “Autumn Sky” and “MoonDreams,” which shows attendees which constellations, stars and planets they can expect to see in the upcoming weeks, will be held at 7 p.m. in the Planetarium, located in Farrington Building Room F102. "MoonDreams" tells the story of Perseus and Andromeda and talks about our moon and where it comes from, as well as introduces other moons in the solar system, according to Michael Prokosch, staff aide for the physics department. In addition, each show will include a discussion about this year’s Dec. 24 Mars Opposition and the "Mars Hoax," an e-mail that circulates every August making exaggerated claims about the planet's visibility from Earth, Prokosch said. Other showings for the semester will be held Oct. 12, Nov. 16 and Dec. 7, all at 7 p.m. The December show will also include information on the annual Geminid Meteor Shower, the best night of which will be Dec. 13 at about 10 p.m., and why it is unique compared to other meteor showers, Prokosch said. The Student Advising and Mentoring Center will give students considering graduate school all of the information they need with an informational seminar on Thursday (Sept. 20). The presentation, which will include a question-and-answer session, will be held from noon to 1:30 p.m. in Lowman Student Center Room 315. For more information, or to register, call 936.294.4444 or visit the SAM Center, in Academic Building 4 Room 210. College of Education students and SHSU Phi Kappa Delta members will join hundreds of thousands of teachers across the country in reading “The Story of Ferdinand” on Thursday (Sept. 20). The Kappans and SHSU students will read the story as part of Jumpstart's “2nd annual Read for the Record” all over central Texas, according to Phi Kappa Delta president Maggie McGuire, who said she, along with many other professors on campus, assigned their students to do so as a class project. Read for the Record is a campaign that aims to create the largest-ever shared reading experience, during which as many people as possible read the same book on the same day. The Future Educators Association, the student division of PDK, is collaborating with the Pearson Charitable Foundation to encourage participation in the event, McGuire said. In last year’s inaugural campaign, more than 150,000 people participated and more than $500,000 was raised to support Jumpstart’s early education work through sales of the selected book, according to the PDK Web site. “The Story of Ferdinand,” published in 1936, is the best-known children’s book written by American author Munro Leaf, which tells the story of a bull who would rather smell flowers than fight in bullfights. Anyone, even non-members, can participate in the event by reading the book to a group of children, or even to one child. Those would like to participate should contact McGuire so their participation can be recorded. Phi Delta Kappa is an honor society of professional educators that supports many activities involving schools and their students. Membership is open for professional educators from their student teaching year on. For more information, contact McGuire at mam013@shsu.edu or 936.294.4638. Four College of Education professors were recognized for their outstanding work in the areas of service, research, grantsmanship and teaching on Aug. 17. Eren Johnson, Bill Edgington, Shirley Johnson and Joyce McCauley were selected by their peers to receive the awards, for which they were presented trophies during the college’s fall faculty meeting. Johnson, professor of curriculum and instruction who is retiring this year after 26 years at SHSU, was recognized for her outstanding service. With 20 journal publications, a dozen published book reviews and numerous conference and workshop presentations, Edgington, associate professor of curriculum and instruction, was honored for his research. In the past four years, assistant professor of educational leadership and counseling Shirley Johnson has written and received five grants, earning her the award for grantsmanship. “Shirley Johnson is making a name for SHSU across the state with her grants writing,” said Judy Nelson, EDLC assistant professor. “Johnson has been a critical part of a total effort aimed at researching and securing grants for the university,” said Sue Horne, EDLC lecturer. A teacher for more than 38 years, 13 of which have been spent at SHSU, Joyce McCauley, associate professor of language, literacy and special populations, was recognized with the teaching award. “You can’t be with Dr. McCauley more than just a few minutes without seeing that she is one person who knows her field, who is truly interested in the welfare of her students and who believes that teaching is the most important and fulfilling profession in the world,” said Dana Carpenter-Baker, instructional specialist at Aldine school district.